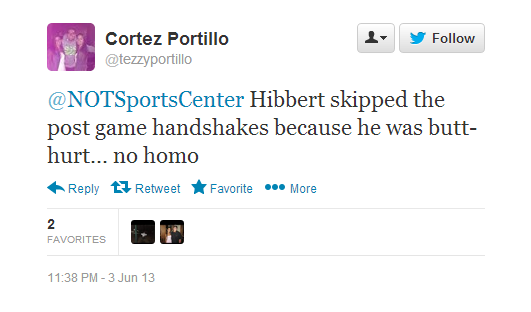 These tweets were in response to @NOTSportsCenter tweets from Monday, June 3. Wrong again. Keep guessing though. 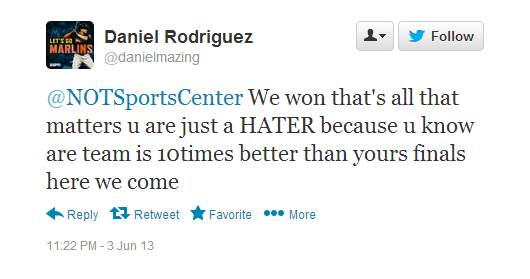 Have you noticed how much Heat fans like using “butthurt”? 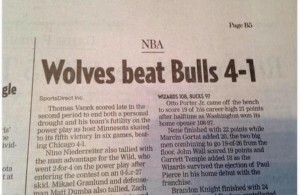 Chris Bosh must be rubbing off on them. Yes homo. Let’s go back to 2010. Would you even know what a basketball is? Could you spell Wade’s first name? Do you even know who Wade is…or do you think we’re talking about walking through water? Exactly. 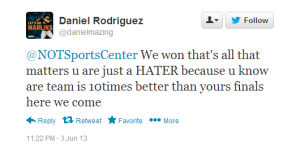 Heat fans cry more than any other fan base yet accuse everyone else of doing it. Try a mirror sometime. Actually our teams made it, we made fun of them too. Wrong AGAIN! 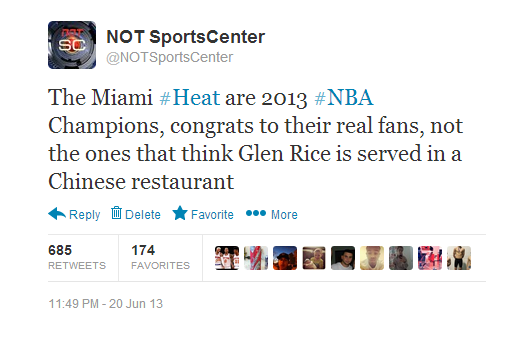 Poor Heat fans can’t get anything right. Tough choice. But like your team and your fan base, you make it way too easy. So we’ll go with neither. We observed that Chris Bosh was playing scared of the post, a great quality to have in a power forward. Heat fan’s response? Damn those jokes that aren’t 100% factually accurate. But does that make him any less scared of the post? Didn’t think so. Exactly. Bosh is a power forward. Just without the power. He’s a “weak forward.” He’s probably even listed as that in Spoelstra’s notes. And if you’re gonna mention us, you should use appopriate grammar. Wait…that would require going to school. Heat fans don’t do that. Sorry, we forgot. Finally….the #GrammarCorrectionSquad better look away from this one. It’s gonna hurt.